The Micropython language is a powerful but compact subset of the Python v3 programming language used to program the very advanced ESP32 microcontroller from Espressif®. Used as a sensor node, or "mote", it is perfect for the Internet of Things (IoT). Micropython was originally developed in late 2013 as a KickStarter campaign by Damien George, from Cambridge University in England. The ESP32 is a very advanced microprocessor that actually has an operating system when flashed with Micropython. It is so fast it can boot from a cold start and connect to your WiFi network in less than a second! The ESP32 is also a champion when it comes to power consumption. It has a deep sleep mode that consumes only 0.01 mA (1 mA = 1 milliAmp = 1 one thousandth of an Amp). That's a theoretical minimum current requirement of 10 microamps, with the ability to operate as a remote sensor on simple AA batteries for years. Having worked with microcontrollers for many years, we think this is a remarkable development, and a substantial paradigm shift from the ease-of-use point of view. If you're familiar with the Arduino revolution, Micropython running on the very powerful ESP32 is arguably as significant. 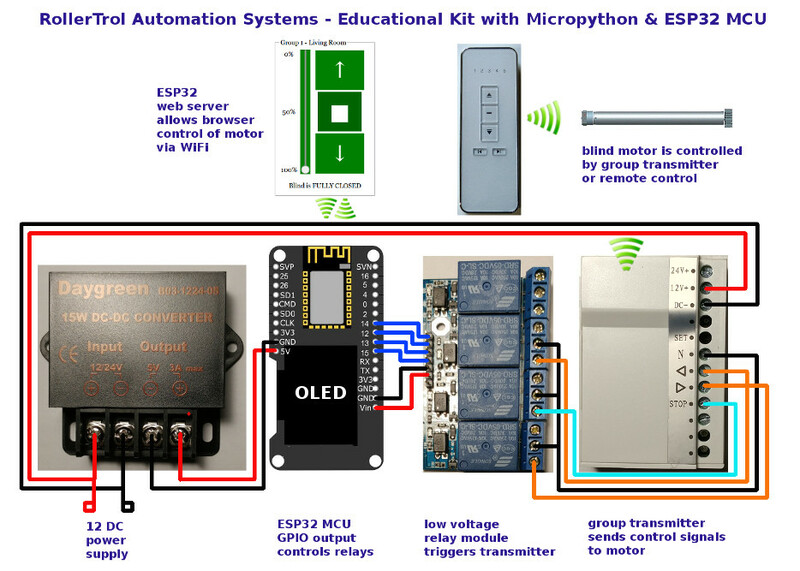 We have developed an educational kit that includes these components, with a remote control shade motor as a practical outcome that you can actually use in your home. This makes a great gift for anyone interested in learning how to use microcontrollers! When you first apply power, the OLED screen (if it has one) will display this message on the screen, prompting you to connect your WiFi to the AP (Access Point) mode of the ESP32. Please type this address into your browser address bar (where you would normally type a website URL). The ESP32 will have already scanned the local radio wave emissions to generate a list of WiFi access points, and this information will appear in the dropdown selector that you see as the first item on the above WiFi config page. When it starts up again, the ESP32 will attempt to connect to your specified network in 'Station' mode. 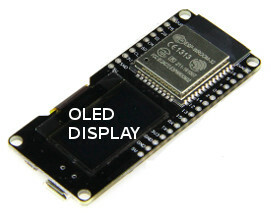 This is normally a very fast sequence, less than a second, and the OLED display will also indicate that you are successfully connected to your WiFi network (pictured). The ESP32 will also detect the new IP address that the DHCP system in your router assigned to it. It isn't an urgent consideration, but we reccommend that you bypass the DHCP system and assign a static IP address so that it never changes. You will need to login to the administrative section in your router to do this, and although it is generally similar, the process will vary from manufacturer to manufacturer. 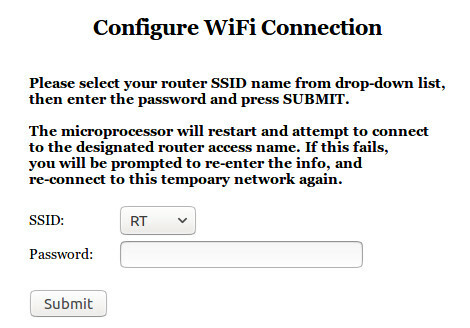 For more instructions, please search the internet for your router model number, or consult your user manual. If you have entered incorrect WiFi connection information, or the device cannot connect (for whatever reason), the ESP32 will make 30 attemps to connect (in case you happened to cycle power on your WiFi router) before it gives up. It will timeout at that point and reboot, bringing up the WiFi config screen again. It will continue this loop procedure until you input the correct configuration settings. We will later see where you can simply edit a file with WiFi settings, if you prefer. It does not find those settings as they have not yet been entered, so it launches the config_wifi.py file that allows you to set the parameters. You can examine the code in the above files as an example of how readable Micropython is. We have commented the code carefully to help you understand the program branching. 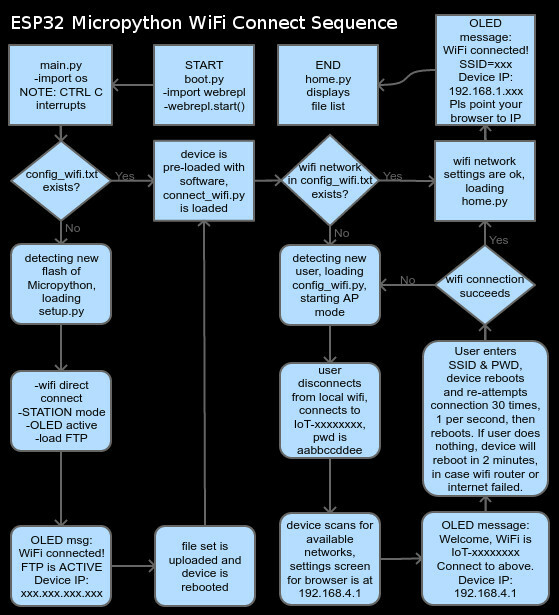 This is a flowchart showing the details of the process of connecting to your WiFi router. Please note that there are several different ways to program the ESP32, and we chose Micropython for a number of reasons, as it is easy to understand the code syntax, and the operating system provides very useful advantages.